OUR LADY OF FATIMA ACADEMY! The big news at our school this week was our community meeting on Wednesday evening. At the meeting, Stacie Stueber, Assistant Superintendent of the Diocese of Bridgeport discussed the new governance model where we will transition next year to becoming an Academy. The Academy model will put more responsibility and ownership in the hands of the School Board and you parents. As OLF is becoming an Academy, we are taking our Personalized Learning Program to the next level by incorporating multi-age classrooms for Kindergarten through fifth-grade. Research indicates the benefits of multi-age classrooms, but OLF has seen it first hand during the 2018/2019 school year with the first and second-grade merged class tracking above grade level as the year has progressed. These academic strides are seen in addition to the social-emotional benefits known to multi-age classrooms. With this move the new Our Lady of Fatima Academy is uniquely positioned in Fairfield County and will continue to provide strong academics and cultivate leadership skills, but now taking it to the next level. With this move to multi-age class sizes are being capped and the Kindergarten/first grade currently has only two openings left. There are still openings in 2/3 and 4/5 combined classes. Our middle school will remain running as it has been with some multi-age experiences as deemed appropriate. Pre-K will continue to operate as it has in 2018/2019. I am available to meet with anyone who has questions or wishes to discuss further. As our school continues to evolve, I want to hear from you, as it is your school. With that I would like to resume my weekly "Coffee with the Principal" meetings. We will meet in the French room from the end of morning prayers (approximately 8:15 a.m.) to 9:00 a.m. This Monday, April 8th, I would like to begin with meeting with any interested parents from next year's Kindergarten/First Grade Team. The complete "Coffee with the Principal" schedule can be found in Coming Events (BELOW). 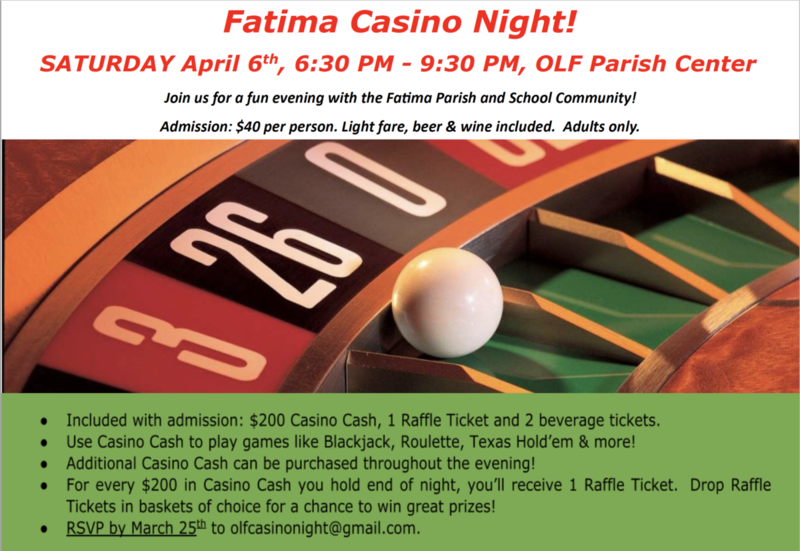 The Fatima Casino Night is tomorrow, Saturday, April 6th, from 6:30 PM to 9:30 PM in the Parish Center. 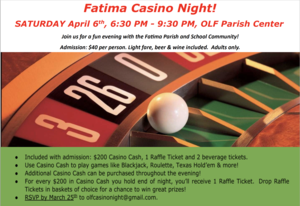 This is your Chance for an Evening of Fun with the Fatima Parish and School Community! Admission: $40 per person. Light fare, beer & wine included. Adults only. With your Admission, each person will receive $200 of Casino Cash play money, one Raffle Ticket, and two beverage tickets. Use your Casino Cash throughout the night to test your skills at popular table games like Blackjack, Roulette, Texas Hold'em and more! Want a bigger stake? You can purchase additional Casino Cash throughout the evening! At the end of the night, it's time to cash out! For every $200 in Casino Cash you hold, you'll receive one Raffle Ticket. Drop your Raffle Tickets in the baskets of your choice for a chance to win great prizes! (A) "REFER A PROSPECTIVE STUDENT"CONTEST." Father Reggie has graciously offered to donate ONE (1) year of Tuition for one student, to the current Fatima family who generates the most referrals that register at our school by June 1, 2019, and attend in fall 2019. 1. Simply refer a prospective family to Fatima. 2. Let Mrs. Favier know the names of your referrals for tracking. 3.Your family will receive contest credit for every referred student that registers by 6/1/19 and attends in fall 2019. 4. You can tell prospective families that school tours and shadow days are available by appointment OR encourage them to come to our Sunday, April 28th Open House. Remember, current families and students are Fatima's best ambassadors. To help with our marketing efforts, I have new lawn signs to place in front of your home. New families tell us that seeing these signs is a very powerful factor in visiting our school. This Monday is our Science and STEM Fair for grades K-8. It will be held between 1:15 p.m. to 2:30 p.m. Please mark your calendars! We hope to see you here to enjoy your child's work! This is a "must attend "evening as we honor all Fatima athletes and Chess Team members. Please mark your calendar. More details to follow soon. Save your bottles and cans - recycling will return to Fatima on Saturday, June 1st. Thanks for organizing this initiative, Carmel Bowron! A big thank you to Student Council and Mara Fleming for their successful food drive supporting Notre Dame High School's annual drive to support the local food pantries. Bravo, Student Council. Our school went to weekly Mass this morning. The Mass was hosted by the fourth grade. The fourth graders also did the readings and brought up the gifts. The altar servers were fifth graders. Everyone did a spectacular job! The readings were clear and fluent; the altar servers knew their jobs perfectly. Several parishioners went out of their way to complement our students. Bravo, Our Lady of Fatima! We got rave reviews about the 8th-grade pizza fundraiser today. If you missed it and are ordering for the next weeks be sure to get your order in by Wednesday. We need to PREORDER the pizzas and cannot add orders the day of the lunch. If your child wants to add a second slice for the next orders, please send back the attached additional order form along with the additional payment of $3.00 so that we can adjust the numbers. Our wonderful Chess Team returns for a nine-week Spring Season. It is open to all first through eighth grade students. The flyer is attached below and thanks to Susan McCall for organizing! Can you say, Checkmate? Fatima will be offering Spring Soccer lessons for students in grades Kindergarten through fourth grade. The flyer is attached below and ... (wait for it) …thank you to Susan McCall for organizing! Our pilot Mentoring Program has begun. The mentors have finished their three weeks of training and have met their mentees. The structured mentoring time will take place during lunch and recess on Wednesdays. We have a total of 46 children involved in this innovative program. This is another example by our students of "Service above Self." A big thank you to Mr. Rob and Mr. T for their efforts in starting this program. Information on the Pre-K, K, and First grade Summer Primary Program has been sent home. Thanks for our patience. The Primary Program will run from 8:00 a.m. to 5:00 p.m. every day. It will offer daily athletic, arts and crafts, academic skills and game activities. The maximum we can accept for any week is 25 students and we need at least 12 students to run the program that week. The program will be staffed by our own Mariah Conte, Patty O'Shea, Angelo Tsingerliotis, Kathleen Goodale, Trish Kaczmarek, and other guest staff. Finally, the Summer Primary Program will cost a very reasonable $275 per week. Sign-up has begun for our summer basketball camp. It is a basketball camp that focuses on skills and fun and will run for four weeks beginning the week of July 9th. It is run by Coach Joe Vazzari from Trinity Catholic and staffed by OLF alumni. The camp runs from 9:00 to 3:00 each day and the cost is $250 per week. Please contact Linda Sweeny at 203-434-3441 at lindasweeny@icloud.com with questions or to register. Susan Schneider and Katrina Pesta. After working all day at their respective jobs, both Susan and Katrina came back Wednesday evening to provide two-hours of child care for our students while the parents were in our community meeting. This is a pure act of "Service above Self" and needs to be recognized. Thank you, Susan and Katrina! Diane Robinson. As you know, I always try, in my own way, to recognize acts of service to our school and community. However, inevitably, l make a mistake and leave someone out. Last week, I thanked the two Cross- Country coaches and left out Diane Robinson. This was a major oversight in that no parent does more behind the scenes than Diane. Whether it is at the basketball tournament, at play practice, or at cross-country practice, Diane is always volunteering and working to help our school. Thank you, Diane! Cindy and Albert Blizzard. The next time you are in the school, please stop and view the beautiful wood carving of the Last Supper that is now hanging in our lobby. It was donated by Cindy and Albert Blizzard. Thank you, Cindy and Albert, for this beautiful donation. April 8th - Coffee with the Principal for next year's K/1 Team. April 8th - Science and STEM Fair for grades K-8 between 1:15 p.m. to 2:30 p.m.
April 24th - Coffee with the Principal for next year's 2/3 Team. May 1st - Coffee with the Principal for next year's 4/5 Team. May 1st - National Jr. Honor Society Induction Ceremony at 1:00 p.m.
School Gala at 7:00 p.m.
May 19th - Spring Play Sleeping Beauty at 3:00 p.m.
June 5th - Pre-K/Kindergarten Graduation at 1:30 p.m.
June 7th - Spring Concert at 1:15 p.m.
June 14th - 8th-Grade graduation in the church at 7:00 p.m.
June 17th - Last day of school for K-8.